In my hands above you will see one of my Seven Inches Of Love, a regular feature of my own which, as “Super Sub” (I think that’s official), I sort of apply each time I get a week or more to fill. It’s an excuse to bring in a vintage seven-inch vinyl single from my flight case at home and play it on the radio. This is more than I can do with it at home, as I don’t have a record player. 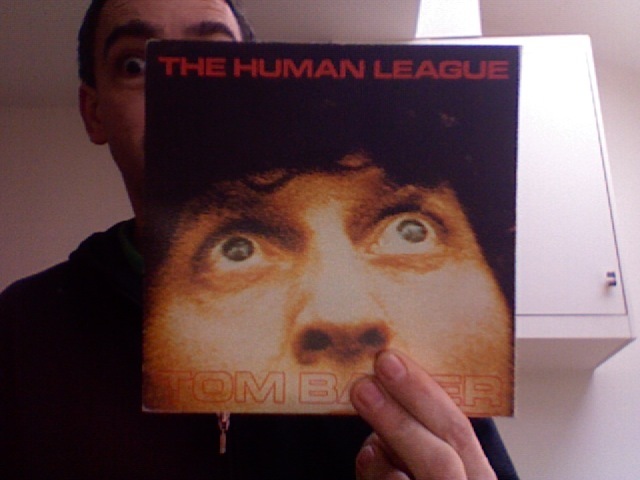 So, indulgent, but fun, and tonight’s was Tom Baker, b-side of Boys & Girls by The Human League, from 1981. A gatefold seven-inch sleeve with a fabulous cover. It sounded great on the radio, all moody and electronic and foreboding. I remember my friend Dave buying it for me, because he was buying a copy for himself and he asked me if I’d like him to buy me my copy (physically buy, not pay for). 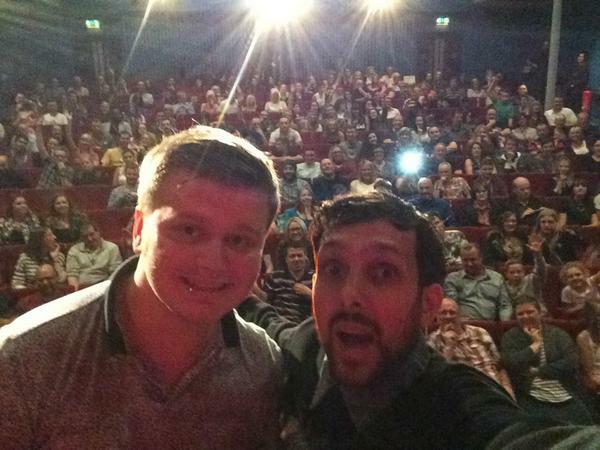 So he handed it over one evening, at Film Club, in fact, and I remember it being in a plain brown paper bag. He’d traced the cover image in pencil onto the bag – a detail I forgot to mention on air. 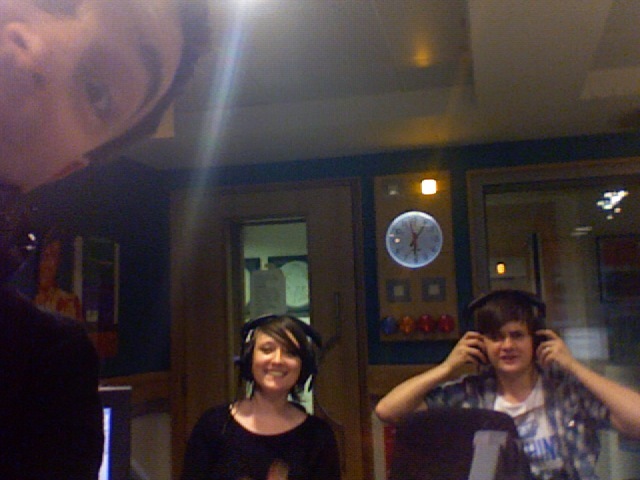 Anyway, here, for the record, are my excellent team this week: Alannah and Paul. She revealed today that someone told her she looked like the little boy who appears on the quiz show in the film Magnolia (from whose soundtrack we played Wise Up by Aimee Mann). This made me smile. She sort of does. But it’s not an insulting comparison for someone to have made, I don’t think. 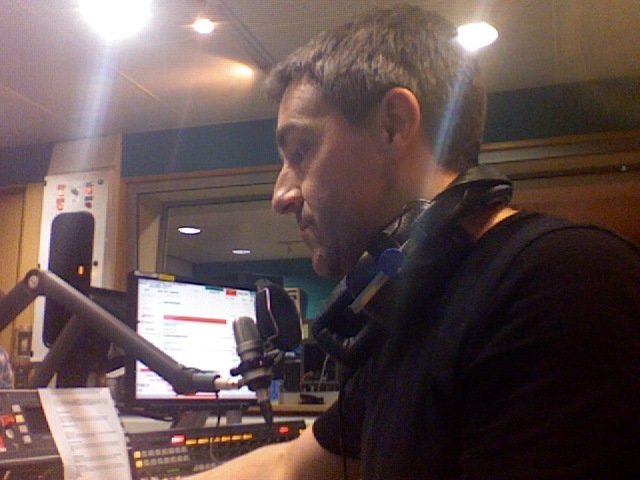 So, an action shot from the 6 Music studio to end this entry. I left my blue scarf either in the studio or on the back of the chair in the office where Nemone puts her coat. Hope it’s still there tomorrow. I have become attached to it. Watched another Law & Order UK and an episode of Battlestar Galactica back at home: Colonial Day from Season One. (We’re working our way through the box set again. It’s an annual ritual now.) Nice to see Starbuck all scrubbed up, although we all prefer her in her work clothes, right? Oh, and Law & Order UK was good, and had a meaty part for Ruth from Spooks, but was spoiled by something that obviously didn’t translate from the original American script about the death penalty. They should have just dropped it, but instead squeezed it to make it fit by cooking up a totally erroneous thread about a referendum on capital punishment, which nobody in this country wants. Clang!